To get started tracking your time, you will need a tracking client. Hubstaff offers multiple apps across various operating systems and devices, catering to your organization’s unique setup. 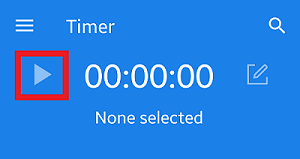 If you want to track time but do not want to download and install any apps or programs, check out our Web Timer to track time directly from your browser. 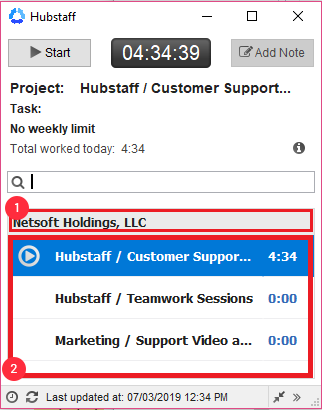 Hubstaff’s desktop tracker offers our full suite of features. 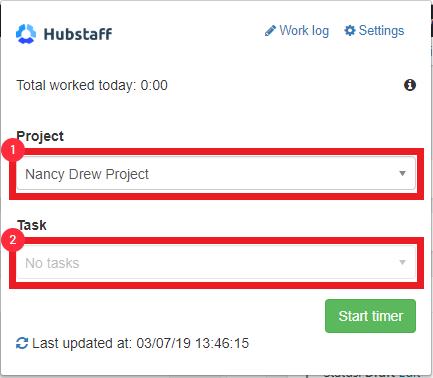 First, you will need to select the project you wish to track time against within your organization. Simply click on the name of the project to select it. You can begin tracking your time in two ways. One option is to click on the name of the project and press the “Start” button directly beside it. Alternately, you can click the name of the project, then press “Start” towards the top of the app. Once tracking starts, a live ticker will count the seconds, minutes and hours you have worked in real time. If your employer has set a weekly tracking limit for you, it will be shown on the client1. You will always know how much time you have left to track within the week. 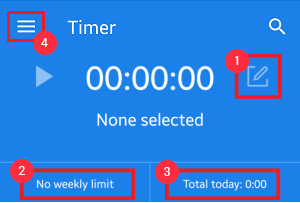 If you do reach your weekly limit, however, a notification will appear, letting you know that no more time can be tracked 2. If you wish to add a note to your timesheet, you can do so by clicking the “Add Note” button. The toolbar located at the bottom of your client, provides a few useful links and functions you should know about. Let’s explore that now. 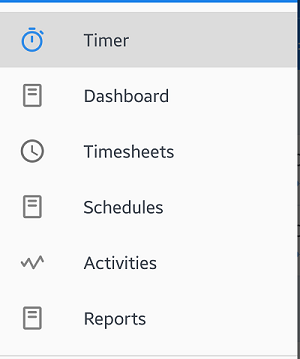 Clicking on the clock icon, will launch a new browser window displaying your timesheets within the web app1. The refresh icon force syncs your data with our servers, allowing your timesheets to be updated immediately2. You can always check the last time your tracking data was synced, by referring to the “last updated at:” status on the toolbar. Our desktop tracker also has multiple layout options. Compact Mode: This mode will shrink your tracker down in to a “compact” size, fitting conveniently anywhere on your screen. To-dos Mode: This mode will expand your tracker, revealing the To-dos panel. If you have a task you wish to track your time against, within a project, it is able to be selected from this view. The main menu is also accessible from this mode. Simply click on the menu icon1 to reveal it. To toggle between views, simply click on the arrow icons as indicated below. 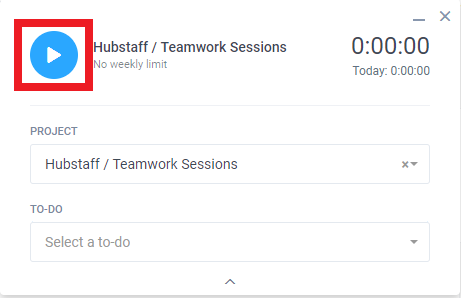 Hubstaff’s Chrome extension & Chromebook App is a quick-install option, allowing you and your team to get set-up and tracking as quickly as possible. 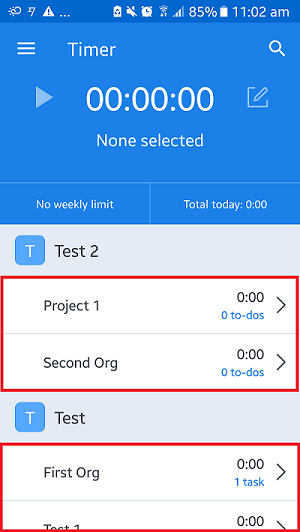 The first step is to select the project1 and/or To-dos2 you wish to track time against. 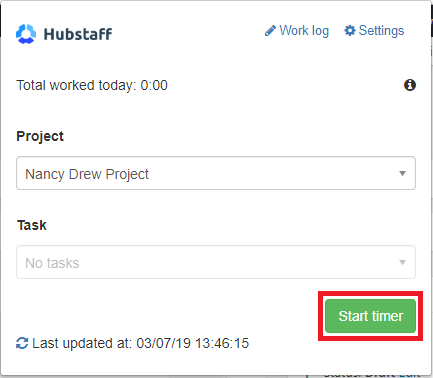 To begin tracking your time, simply select a project and/or task from each menu and click Start. Once tracking begins, a live ticker will count the seconds, minutes and hours you have worked in real time. Two links are available at the top right hand side of your tracker. Clicking on Work log will launch a new browser window displaying your timesheets within the web app1. The Settings button will redirect you to the Settings page, allowing you to customize features within your tracking client 2. The refresh icon force syncs your data with our servers, allowing your timesheets to be updated immediately. You can always check the last time your tracking data was synced with our servers, by referring to the “last updated at:” status on the toolbar. Hubstaff’s mobile app is available on both Android and iPhone. As well as tracking time, our mobile app can also log GPS locations. 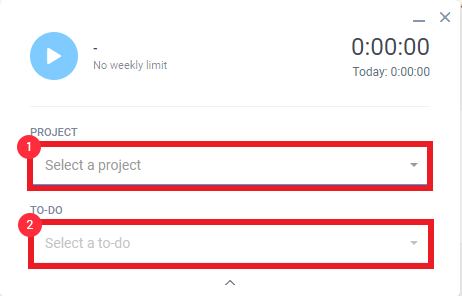 A list of the projects you can track time against is displayed when the app is opened. To access assigned tasks, simply click on the arrow to reveal the tasks pane for each project. To begin tracking your time, simply tap on a project and/or task and click the Start icon. If you wish to add a note to your timesheets, you can do so by clicking the “Add Note” button1. If your employer has set a weekly tracking limit for you, it will be shown on the client2. You will always know how much time you have left to track within the week. However, if you do reach your limit, a notification will appear, letting you know that no more time can be tracked. A running total of the time tracked within each day will be displayed on the client as shown below3. Our mobile app has a number of the web app features available, via the main menu. To access it, simply tap on the menu icon4. Access the mobile menu to reveal features such as reporting, scheduling, and team activities. Having mobile access to these features is handy for users and owners who are on the move. 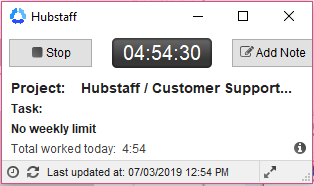 You and your team can track time directly from Hubstaff’s dashboard, without needing to install any additional software. Simply navigate to your Dashboard, and click on the timer icon to open the tracker. Projects (1) and tasks (2) you’re assigned to will appear as below. If your employer has set a weekly tracking limit for you, it will be shown on the client (1). You will always know how much time you have left to track within the week. If you do reach your weekly limit, a notification will appear, letting you know that no more time can be tracked. A running total of time tracked per day will be shown on the client as below (2). Please note all monitoring features are not available on all trackers. For a compatible features list, please see our guide here.